Can I customize the audio prompt voices that visitors hear? Audio options can be set per button so that you can play different prompts for different types of visitors. Start on your Buttons page, click 'visitor buttons' on the right then click to edit a button and go all the way to the bottom of your button settings. When you hover over each one you can see a preview of the audio prompt that you can select and play after your visitor has finished checking in. Audio is selected when it is 'lit up' and not greyed out. 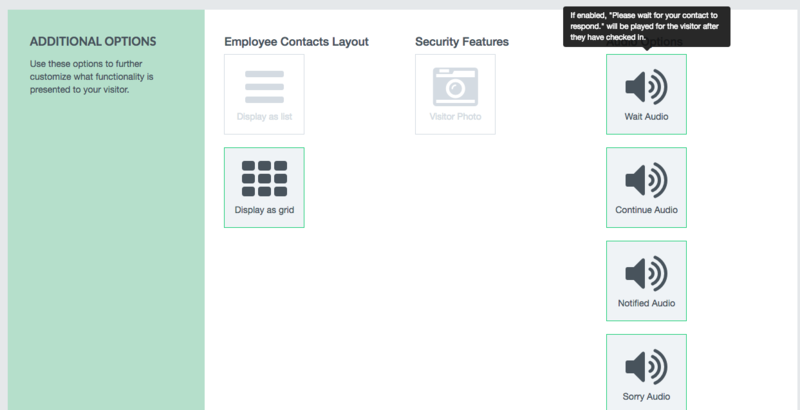 See the 'Display as Grid' option? It has been selected rather than the 'Display as List'. When you enable each prompt, you can also click to edit the audio message that plays for each visitor. Hover over and click to edit the prompt button. You'll then see a pop up where you can customize the prompt message that your iPad will 'read' to your visitors upon check in. The prompts will default to whatever voice has been selected on your device in the iPad settings, but there is a bug with the new iOS 12 that sometimes forces it to be a male voice. You can try to adjust this by going to Settings -> General -> Accessibility -> Speech -> Voices -> English and then choosing Siri Female or Samantha (Enhanced).